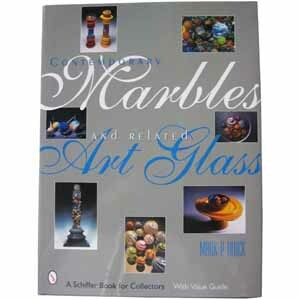 MoonMarble.com - "Contemporary Marbles and Related Art Glass"
Marble Collecting Books and Accessories → "Contemporary Marbles and Related Art Glass"
Contemporary Art Glass by Mark Block is a beautiful coffee table book, featuring approximately 130 glass artist from around the country. We like page 164. It features Bruce Breslow of the Moon Marble Company. A hardback book with 256 pages and over 600 photos.